“A righteousness of imputation, namely, Christ’s righteousness. He shall be called the Lord our righteousness’ (Jeremiah 23:6). This is as truly ours to justify, as it is Christ’s to bestow. By virtue of this righteousness God looks upon us as if we had never sinned (Numbers 23:21). This is a perfect righteousness. Ye are complete in him’ (Colossians 2:10). This does not only cover but adorn. He who has this righteousness is equal to the most illustrious saints. The weakest believer is justified as much as the strongest. This is a Christian’s triumph. When he is defiled in himself, he is undefiled in his Head. In this blessed righteousness we shine brighter than the angels. This righteousness is worth hungering after.” Watson, Thomas. The Beatitudes: An Exposition of Matthew 5:1-12 (Christs Famous Sermon on the Mount) & The Lord’s Prayer pp. 163-164, Kindle Edition. The one who is broken of spirit, understands his lowly stature before God, mourns because of his lack of righteousness, and empties himself of all pride to become meek, he will then hunger and thirst for the true righteousness of God. Flows pretty nicely doesn’t it? Hungering and thirsting for the righteousness is the sustenance of the spirit. 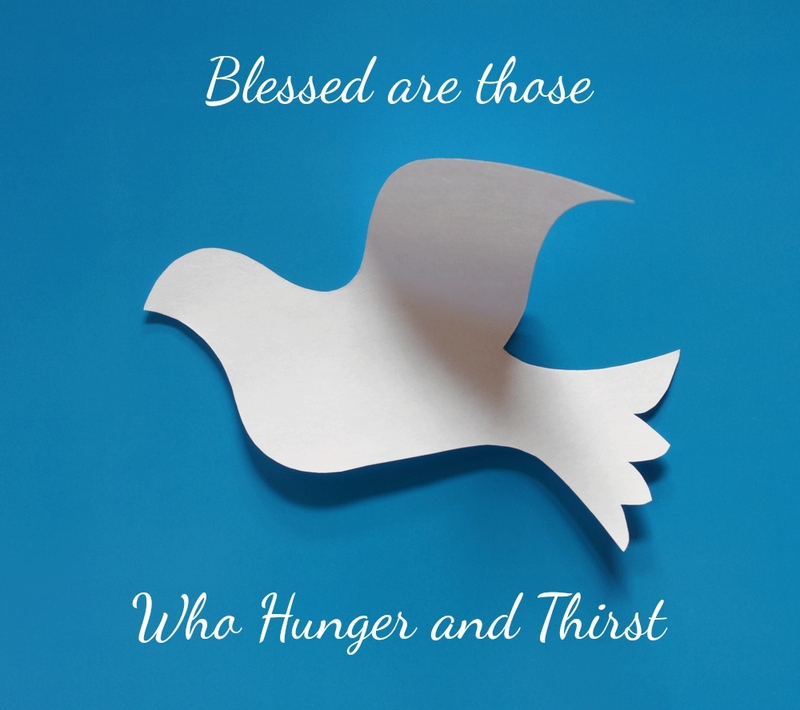 The Christian’s desire should be to satisfy that hunger and quench that thirst. That should be our all-consuming passion. We have, as Jesus is teaching here, emptied ourselves of our old sense of self-righteousness and are now consumed by the righteousness of God. “Do not love the world or the things in the world. If anyone loves the world, the love of the Father is not in him. For all that is in the world – the desires of the flesh and the desires of the eyes and pride of life – is not from the Father but is from the world. And the world is passing away along with its desires, but whoever does the will of God abides forever.” (1 John 2:15-17). The old is cast away for the new righteousness of the Father. The Lord God is our standard of righteousness – the world is not. We are a new creation when we accepted Jesus Christ as our Lord and Savior. Paul tell us in 2 Corinthians 5:17: “Therefore, if anyone is in Christ, he is a new creation; the old has gone, the new has come!” We begin by emptying ourselves of the mess we were, understanding we have no righteousness apart from God and then hungering and thirsting for God’s righteousness. That is a tall order. Still God’s standard of righteousness is the standard of absolute perfection. A standard that we will never fully achieve on this earth. It is, however, a standard we are told to pursue for spiritual sustenance. John Darby, a 19th Century evangelist wrote, “To be hungry is not enough; I must be really starving to know what is in God’s heart toward me. When the prodigal son was hungry, he went to feed on the husks, but when he was starving, he turned to his father.” Before Christ we fed on husks but in Christ we need to feast on the table set for us by our heavenly Father. To have God’s life within us through the new birth in Jesus Christ is to desire more of His likeness within us by growing in His righteousness. When we realize our helplessness and first hunger and thirst for righteousness we seek the Lord Jesus Christ and the salvation He offers. The righteousness that comes when we then turn from sin leads us to submit to the His lordship. As we understand the poverty of our spirit we see our sin; in mourning we cry out and turn from our sin; in meekness we submit our own sinful way and power to God; and in hunger and thirst we seek God’s righteousness in Christ to replace our sin, our old self. With the old passing away, “the new has come!” Our old dead self will be replaced with the Glory of God, full of life and a new standard of righteousness. The newborn soul delights in the things of God and turn from the things of the world and the flesh. Our purposes, feelings, desires, and understandings are fresh and different. We see the world differently. That my friends is the blessing.